The epic adventure continues. . .
Hokk is a criminal outcast who has been scavenging the bodies that fall from the sky to Below for meagre treasures to help him survive. Elia hails from the floating kingdoms in the skies of Above, where the islands' edges are borders no one dares to cross except for the ritual burials that send their dead to Below. Together, these teens embarked on a quest to return to the homes they've lost-but now their journeys have diverged, and their futures are more uncertain than ever. Without Hokk, does Elia have any hope of returning to Above and rescuing her family? Without Elia, will Hokk become just another lost soul roaming the endless plains of Below? 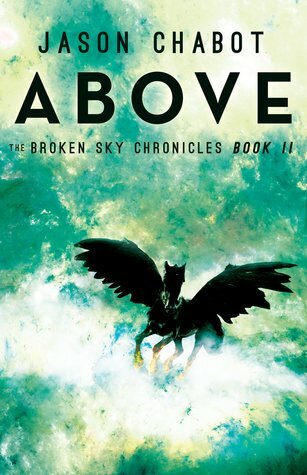 We are pleased to be hosting a giveaway for the complete three-book set of The Broken Sky Chronicles by Vancouver author, Jason Chabot. Here is the next review for this amazing series! We hope that you are enjoying these posts as much as we enjoyed creating them and reading these books. JASON CHABOT grew up in the rural outskirts of Chilliwack, B.C., and graduated from the University of British Columbia. After over a decade as a chartered accountant, Jason now writes full-time at his home in Vancouver, where he also enjoys ballroom dancing and playing classical piano. Visit Jason online at www.jasonchabot.com. Noteworthy experiences while reading this book: After finding this book buried in stuff. I have to say that I am kind of sad that I am only getting to it now. EPIC! Do I Recommend this book? YES!!! Epic Fantasy! Notes and Opinions: This one worked out so well I am very sad that I am just getting around to it now and I wish that I would have gotten to this one sooner. This world that Chabot has created is so beautiful and amazing!! I love that I am back with these characters and their continuing story. This one was a great blend of learning more about both worlds. I really loved the danger and suspense in this one it wasn't really in book one all that much so that was a welcome change. This was one fast-paced ride that answered some questions and gave us some new ones. I am excited to see where this is all going to end up. Go Into This One Knowing: Epic Fantasy/Dystopian! Must Read!